Amazon dominates the e-reader market, and the Kindle Voyage stands at #2 of the Amazon’s line-up, right after the Kindle Oasis and before the Kindle Paperwhite 3. Until recently, Amazon’s Kindle Voyage was the top model until the launch of the Oasis in April 2016. The Kindle Voyage is a step forward from the Paperwhite. The plastic back is replaced with a magnesium material and a fashionable angular design – it is a solid feeling eReader, yet very lightweight. Minimal weight makes the Kindle Voyage a pleasure to hold – it is perfectly holdable with one hand. Flush design means that there is no kinks between the display and the frame for dust to get into. The Voyage introduces a new kind of physical page turn buttons – the feature is called PagePress. PagePress uses sensors in the bezel to turn a page by pressing harder. There is no actual button like the Oasis, but many people still find it easier than just tapping or swiping the display – the only way to turn pages on the Paperwhite. PagePress page turns are effortless and the sensitive strips on both side of the reader operate well. This makes it simple to use left or right handed, and is very useful if you are standing. It is also possible to turn pages by tapping the screen, just as before. The new page turn takes a little while to get used to, but you are assisted by a “response” that lets you know if you have flipped the page. If he page turning important for you, the Kindle Voyager would be a viable choice. Text on the Voyage is crisp and clear. 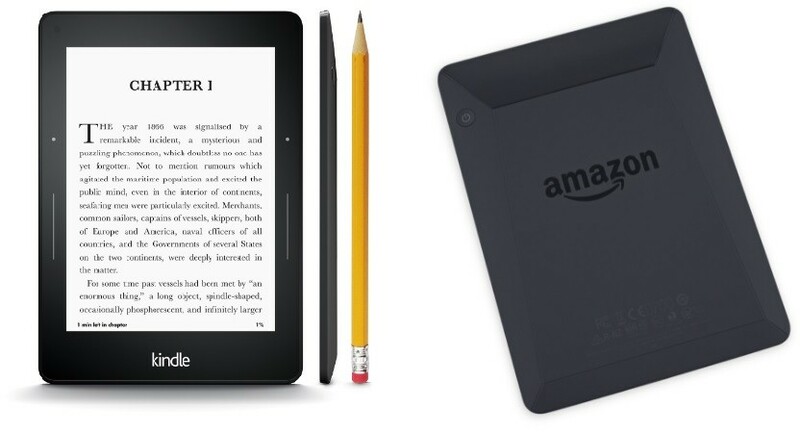 In terms of contrast, the Kindle Voyage has a higher contrast than the Paperwhite. All this makes it better for the reading experience. It has good light for night reading. Automatic dimming of the light when in the dark may be annoying for some users, but this is easily switched off. Voyage’s display is the first to be made from a toughened glass rather than plastic. The Voyage also has an adaptive front light the backlight is better on this ereader. Just like all the latest Kindle models, this device comes with a USB 2.0 cable but no mains charger. The usual Kindle features are there as well: screen time limits for kids, x-ray, vocabulary builder, 8 adjustable font sizes and more. Special offers and sponsored screensavers are displayed in the more affordable versions. As always with Amazon, you have access to books without having to physically go to the shop. The good: Easy to setup. Intuitive and refined. Effortless page turns. Light and easy to use one handed. The Voyager is smaller and more user friendly than the KPW. The bad: New position for power button on/off button on the back at the top right hand corner is convenient but it also means that cases for other Kindle models are generally not suitable. The Kindle Voyage is more advanced in many ways, but you have to pay a lot more compared to the $99 Paperwhite. Does anyone need the $199 Voyage? The answer is “Yes”, otherwise why would Amazon introduce the Kindle Oasis that costs $290?